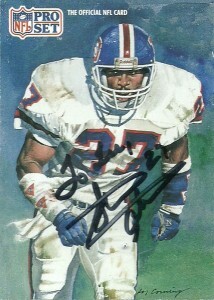 Steve Atwater was a dangerous, hard hitting safety who quickly defined the role during the late 80s and 90s, (when great safeties roamed the Earth unencumbered by the more liberal passing rules and hitting restrictions that now restrict the defensive game) and is the all-time leader in interceptions at Arkansas. Drafted in the first round of the stellar 1989 draft over other talent because of his leadership qualities, Atwater was quickly inserted into the starting lineup beside Dennis Smith by new defensive coordinator Wade Phillips who employed him near the line of scrimmage to enforce the run. Steve would validate his selection by making 124 tackles and 3 interceptions finishing second behind Derrick Thomas for Defensive ROY honors that season. 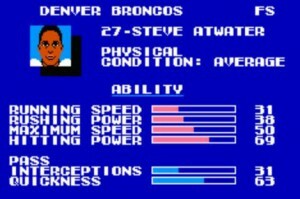 Over the next 9 seasons for the Broncos Atwater would become a lock for the Pro Bowl and as an All Pro (1990-1996, 1998) for his solid play and tackling. 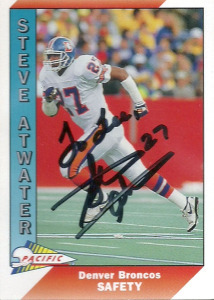 Steve would make a career high 5 interceptions in 1991 and won two Superbowl rings with the Broncos in 1997 and 1998. However in 1999, Steve would be a salary cap casualty and play one final injury marred finale for the New York Jets. In retrospect, Atwater has left astounding tackle numbers on the table for a safety. Another unsung hero who should be in the HoF, Steve has never gotten his due- perhaps because he plays at such an unglamorous position. 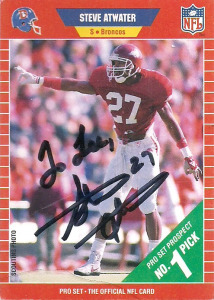 Since retirement, Atwater has been bestowed many honors including: Being named to the All-Decade team of the 90s, the Broncos Hall of Fame, the Arkansas Sports Hall of Fame, and the Razorback All-Century Team. It was really tough to choose which cards to send as there were some nice cards of Atwater’s hitting but I settled on these showcase cards. I had heard that Atwater was a wonderful respondent TTM with fans and I was not disappointed receiving these back in a bit over 40 days personalizing them to me as well.